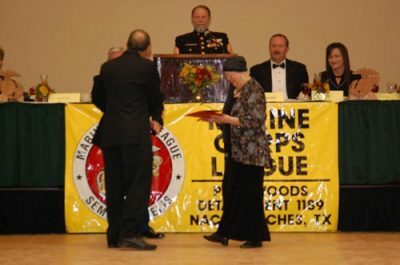 Received by John's mother and step-father on his behalf at the 2008 Marine Corps League Birthday Ball. Selflessness is the hallmark of Marine Corps service. While serving in Iraq , Garrison native 1stSgt John W. Mathews III contacted the Pineywoods Detachment to ask if we would like to have a flag flown over Camp Raines , Iraq . 1stSgt Mathews learned that the detachment was delighted to receive such a gift. In the relationship that followed 1stSgt Mathews not only sent a flag to the Marines of Pineywoods Detachment, but through his Marine contacts, he provided flags to five other veterans' organizations in Nacogdoches County . Disabled American Veterans, Veterans of Foreign Wars, American Legion , Vietnam Veterans of America , and the Purple Heart veterans all benefitted from his generosity. 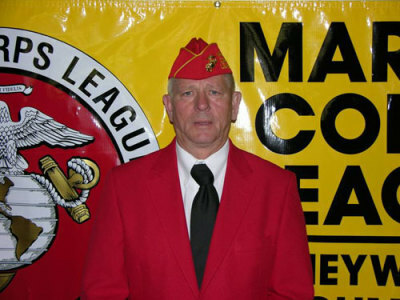 1stSgt Mathews also joined the Marine Corps League. Now safely returned from Iraq and stationed at Camp Lejeune near Jacksonville , North Carolina , 1stSgt Mathews continues to communicate with the local Marine group. In recognition of his selfless and dedicated service to the United States of America, the Marine Corps, and the veterans organizations in his East Texas home communities, we are proud to present the Marine Corps League Distinguished Service Medal - Bronze to 1stSgt John W. Mathews III. "Dedication and commitment" best describe Richard M. Barnhart. When approached to create a Pineywoods Detachment web page, although not at the time a member, Barnhart created and had the page up and running within two days. He then joined the Marine Corps League. Since he became a member, Barnhart has been the detachment's Web Sergeant. Charged with maintaining the site, he updates and keeps accurate all information, uploads recent photographs of Detachment activities, and continually refines the page design constantly looking for new and creative ways to showcase the Detachment mission. He presented a training session to other detachment representatives at a Department of Texas District 2 conference where he generously shared his knowledge and experience. When asked, he has created or helped several other local organizations launch their websites. Recently, the Detachment explored the possibility of holding a charity golf tournament. Barnhart visited several venders to determine the likelihood of corporate sponsorship and, at his own expense, traveled to most of the golf courses in East Texas seeking advice regarding organizing a tournament. Barnhart represented the Detachment nearly every day of the Piney Woods Fair. He recently spoke to a local chapter of Rotary International on behalf of all veterans' organizations including the Marine Corps League. Barnhart is also the Detachment's Sergeant-at-Arms and Public Information Officer, and participates on several committees, writes for the Detachment newsletter, and, with his family, remains active in the community. 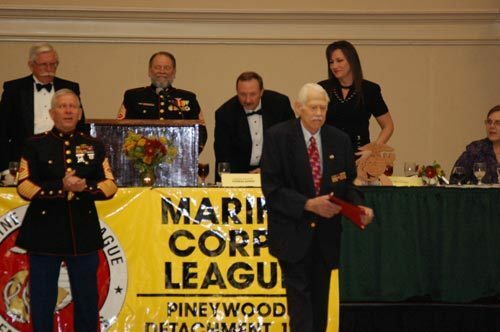 For his unswerving and tireless dedication to the United States Marine Corps, The Marine Corps League, and the Pineywoods Detachment, it with great pleasure that Detachment Marine of the Year is presented to Richard M. "Rich" Barnhart. The Pineywoods Detachment of the Marine Corps League is fortunate to have an exceptional Adjutant. A charter member, William W. Lane has fulfilled all the demands of that challenging position, providing consistency and stability during the Detachment's first chaotic years. His quiet, efficient style and single-minded purpose have ensured that the Detachment's essential records are kept and submitted, and the history of the organization preserved. Lane participates in many other ways as well including physical support at events in which the Detachment is involved. He is always at the Veterans Day Parades, helps display the flags at the County Court House on patriotic days, is supportive of the Toys-For-Tots effort each year, and participates on various committees as needed. For his exceptional service to the United States Marine Corps, the Marine Corps League, and the Pineywoods Detachment, the Meritorious Individual Commendation is hereby presented to William W. "Will" Lane. Semper Fidelis is the motto of the United States Marine Corps. It means "always faithful," and that describes Bryan Leroy Hatten with two Ts. Hatten is a veteran of both World War Two and the Korean Conflict and has earned the right to limit his participation in the Pineywoods Detachment, of which he is a charter member. But that is not his way. Despite his tender years, this "feisty old warhorse" regularly makes meetings, and is present at many of the Detachment's functions, often at his own peril. He recently was released from the hospital to stand a post during the Piney Woods Fair, only to have to return to the hospital as a result. Such is the dedication of this Marine. For his tireless dedication to the United States Marine Corps, the Department of Texas, and the Pineywoods Detachment, we are proud and honored to present to Bryan Leroy Hatten a Meritorious Life Membership. 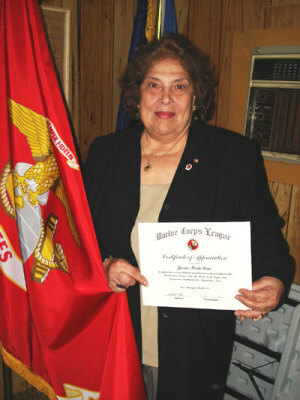 For her faithful service to the Pineywoods Detachment and for her generous support of Detachment programs. From the Vice Commandant, District 2, Department of Texas for his presentation of the duties of a Web Sgt at the District 2 Meeting at Terrell, Texas on 20 September 2008. Often, people outside the Marine Corps League have a dramatic impact on the success of its endeavors. Gailon Fletcher is one such person. Fletcher is a retired Air Force officer who is active in the community's veterans' organizations including the Disabled American Veterans and the Veterans of Foreign Wars along with its honor degree, the Military Order of the Cootie. 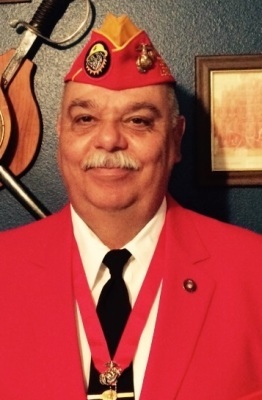 He has held many offices in the VFW and Cooties, but he is involved in every aspect of the mission. 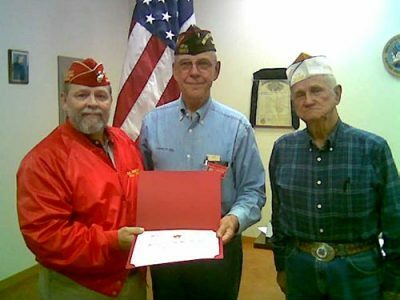 For the VFW he assists in weekly dances, district meetings, and when needed is an accomplished Bar-B-Que chef. When the Pineywoods Detachment needed a fundraiser, Fletcher smoked more brisket than was needed. 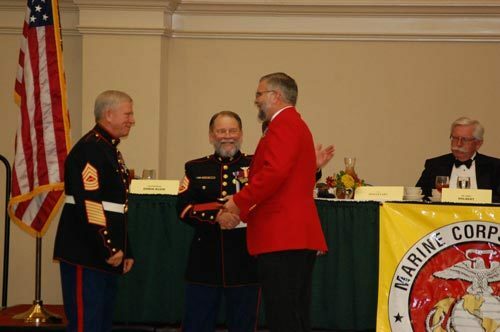 In 2007, when the Marine Corps Birthday Ball caterer cancelled at the last minute, he once again stepped in without hesitation and provided smoked brisket and ham, which helped make the evening a success. 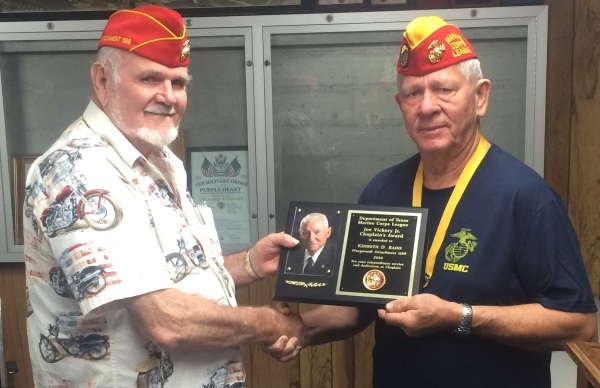 For his unswerving dedication to the area's veterans and to the Pineywoods Detachment, we proudly present to Gailon Fletcher an Honorary Membership in the Marine Corps League. In this technology-driven, Twenty-First-Century world, one of the most valuable assets any organization can have is a well-designed, user-friendly website. 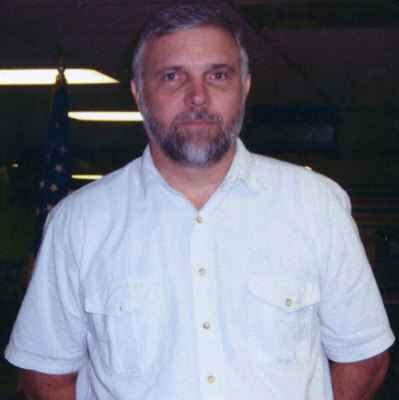 Richard (Rich) Barnhart is a retired Marine Corps Gunnery Sergeant and computer systems manager employed by Stephen F. Austin State University. 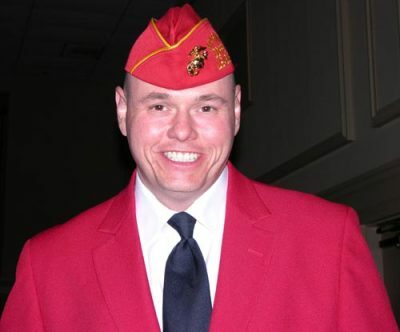 When he heard that the Pineywoods Detachment of the Marine Corps League needed a website, he personally assumed responsibility for design and development of a website. This was accomplished within two days of receiving the request from the Detachment. Barnhart continues to maintain hands-on control of the daily operation and continuous improvement of the Detachment website he designed. In addition, he joined the Marine Corps League and accepted assignment as the Detachment Web Sergeant. We would like to take this opportunity to thank our new member for his outstanding and generous service to the Pineywoods Detachment, the Marine Corps League, the United States Marine Corps, and the United States of America. It is with great pride that we present to Richard (Rich) Barnhart the Distinguished Service Award-Bronze. 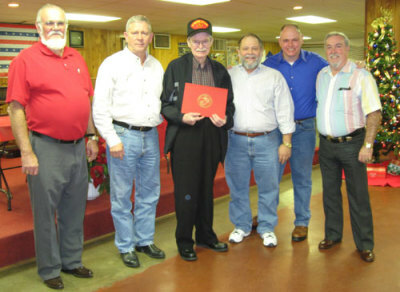 (L-R)Kenneth Rains, Dan Singeltary, Billy Duke, Dennis Bradford, Will Lane, Don Kirkley. Billy Duke is a World War II veteran and a survivor of the battle for Iwo Jima and other bloody campaigns in the Pacific theater. He is a long-time member of the Veterans of Foreign Wars and has volunteered for years at the Charles Wilson VA Outpatient Clinic as a member of the Veteran’s Service Committee. Billy is present at almost every event honoring Veterans, ceremonies, parades, funerals, or organizational meetings. If he can stand at a funeral, he will be there. He has never forgotten his fellow Veterans or his love for the Marine Corps. He became a charter member of the Pineywoods Detachment when it was formed, and has served as Judge Advocate, and now as Detachment Chaplain. We honor Billy Duke’s service to our country, and his continued service to veterans and his fellow Marines by awarding him a well-deserved Marine Corps League Distinguished Citizen Medal. One of the programs almost always associated with the Marine Corps League is "Toys for Tots." Christmas toys are collected and distributed to needy children throughout the collection area. Usually organized through Marine Corps Reserve units, the Marine Corps League is also usually there to assist. In Nacogdoches we do not have a nearby Marine Reserve unit, and up until two and a half years ago, there was not a Marine Corps League Detachment. But there was "Toys for Tots" thanks to the efforts of Ronnie Bowser. Bowser personally assumed the responsibility for the collection, distribution, and documentation of thousands of toys from Nacogdoches to needy children at Christmas. This year we hope to join in and assist him in this effort, and he, in turn has joined us as an Associate Member of the Marine Corps League. We would like to take this opportunity to thank our new member for his outstanding and generous service to his community and to needy children throughout the entire county and beyond. It is with great pride that we present to Ronnie Bowser the Distinguished Service Medal. Bradford serves as the Junior Vice Commandant of the Pineywoods Detachment. As such, he has devoted many hours to his primary duty as “chief recruiter” for the detachment. He has been responsible for encouraging many of our newer members to join the League. Additionally, he has written forms and letters that aid in recruiting new members and retaining existing members. Without a second thought, Bradford attended, at his own expense, the Department of Texas State Convention in San Antonio last June, from which he returned full of new ideas. Constantly considering ways to make our Detachment better, he established, and serves as the Editor of, and practically single-handedly publishes, the Detachment’s newsletter which we named the “Pineywoods Poopsheet.” The newsletter began with its first issue in July 2007. 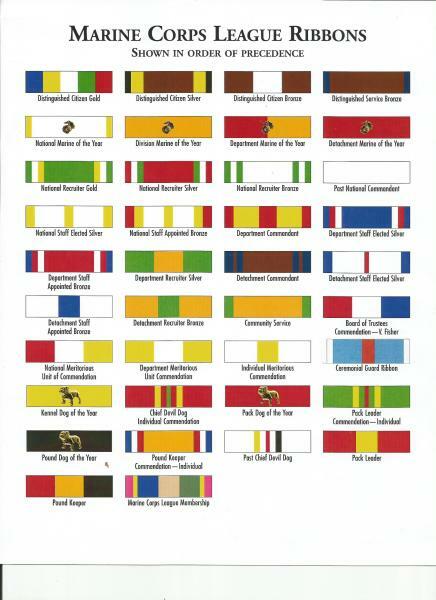 It is professionally organized and informative, with color photographs and articles on all aspects of the Detachment, the Marine Corps League, and the Marine Corps. It is a first-class publication which brings credit to the entire Detachment. Not one to rest on past accomplishments, Bradford helped recruit Richard Barnhart to assist us in building our own website. He also helped convince Barnhart to join the detachment. The outstanding results can be seen at pineywoodsmarines.org. 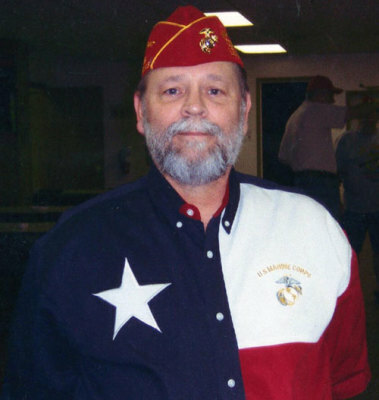 In addition to his work with Rich Barnhart, Dennis has also devoted countless hours to our participation in the Pineywoods Fair, The Marine Corps Ball, and other upcoming events. During my term as Commandant of the Detachment, we have established three key committees. Junior Vice Commandant Bradford chairs or is a member of all three. As Commandant of the Detachment, the highest award that I can present is the Detachment Marine of the Year Medal - for service to the League above and beyond the call of duty. Therefore, it is my privilege to award the Detachment Marine of the Year Medal to Dennis Bradford. Chaplian Billy Duke was presented with a Life Membership in the Marine Corps League, courtesy of the Pineywoods Detachment for his service to the Detachment since it's establishment, his support of veterans at the Charles Wilson VA Outpatient Clinic in Lufkin, his ongoing support of veterans programs in the Nacogdoches area, and for his "Can-Do" spirit. 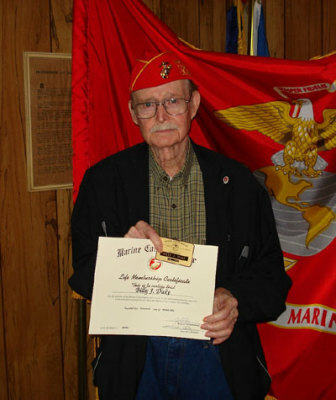 Billy is a veteran of WWII, and served with 2nd Battallion, 9th Marines, 3rd Marine Division in the Pacific campaign including the battle for Iwo Jima. In addition to being a retired Marine Corps Master Sergeant, Dan Singletary is the Nacogdoches County Veterans Service Officer, a post he has held for a decade. In that capacity, he goes beyond the call of duty to help veterans, veterans’ families, and veterans’ widows receive the benefits they have earned and rightfully deserve. As a charter member of the Marine Corps League, Pineywoods Detachment, Singletary has continually served as Junior-, and Senior Vice Commandant, and has on occasion assumed the duties of the Commandant when necessary. Singletary is a member of several Detachment committees including the Fundraising Committee, and has arranged the acquisition of valuable items from local merchants. The items were raffled to generate money for various Marine Corps League programs. In addition, he is the single most successful fundraiser in the Detachment, having sold more tickets than any other member. 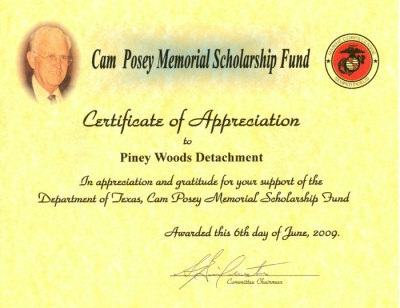 We would like to take this opportunity to thank Dan Singletary for his outstanding and generous service to area veterans, the Pineywoods Detachment, the Marine Corps League, the United States Marine Corps, and the United States of America. It is with great pride that we present to Dan Singletary this Meritorious Individual Commendation-Bronze. 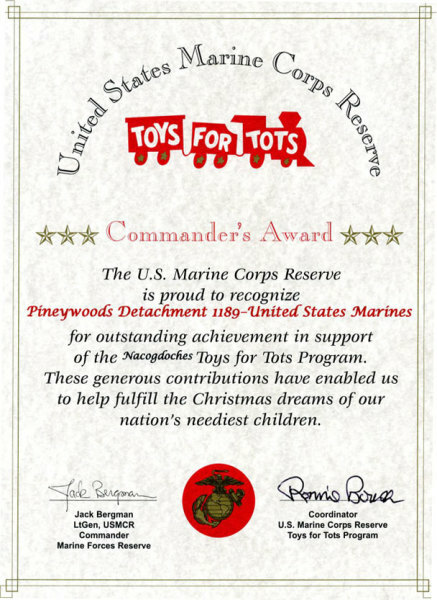 Pineywoods Detachment 1189 received this Commander's Award for assisting with the 2007 Toys for Tots Program in the Nacogdoches Area. Gean B. Hale began his education in 1938 at Kilgore College, but World War Two found him in the Army, where he flew Army transports "over the hump" in the China-Burma-India theatre of operations. After the war, veteran Hale attended East Texas State College, now Texas A&M - Commerce. An athlete, he played football at both schools. After graduation, Hale was employed by Palestine High School, and then came to Nacogdoches in 1952, when he became head coach at Nacogdoches High School, a school than had not won a game the previous year. For the next 14 years, Coach Hale guided the Dragons to a District Championship in 1962, and a bi-District Championship in 1965. He compiled an over-all record of eighty-three (83) victories, fifty-three (53) defeats, and six (6) ties. Hale's contribution went beyond the athletic field. He stressed the qualities of honesty, hard work, dedication, and high ethical standards in all his students. After he left the academic world, Hale became an officer in Commercial National Bank. Although no longer a teacher and coach, his influence upon the students at Nacogdoches High School continued. Along with L. H. Mathews, his longtime friend, fellow coach, and successor as head coach at NHS, Hale established an endowed scholarship through the Nacogdoches High School Alumni Association open to any student who demonstrates the qualities of leadership, scholarship, and commitment. In 1979, Hale was inducted into the Texas High School Coaches Hall of Honor, and entered the Kilgore Ranger Athletic Hall of Fame in 2003. For his outstanding example, and his contributions to his country, state, and community, we are proud to present to Gean B. Hale the Marine Corps League Distinguished Citizen Award. Ed Gaston was a native of Nacogdoches, graduating with honors from Nacogdoches High School in 1942. On 25 November 1942, while a student at Stephen F. Austin State Teachers College, he enlisted in a Navy-Marine Corps officer candidate training program. When he reported to Louisiana Tech College at Ruston, it was discovered that he was color blind, and ineligible for an officer commission. He was returned to standby for assignment to basic training and finally reported to Marine Corps Recruit Depot, San Diego on 7 October 1943. His color blindness would later serve him well as a field artillery spotter who could see through the Japanese camouflage during combat. A year later, he was on the island of Leyte as part of General MacArthur's famous return to the Philippine Islands. His service to the Corps was not remarkable, as compared to the many heroes of World War II, but he wrote hundreds of letters home to friends and family with the skill of a journalist and the mind of a philosopher. From Guam, on 1 April 1945, Gaston wrote to his parents, "This is a grim game, the worst there is; and we have to be alert at all times. But if we allow fear to govern our alertness, we won't last two seconds. Just as in a football game, a player can't stop to entertain fears of injury from a block or tackle. If he does, the game passes him by. Of course, in combat, it is impossible to keep fear repressed all the time. But about the time you get a little frightened, something happens which makes you so mad you forget about fear." After the war, Gaston married Martha Middlebrook, of Nacogdoches, on 16 February 1946. He completed his Bachelor of Science degree in 1947 with the highest honors at Stephen F. Austin. He took graduate courses in journalism at the University of Texas, then completed his Master of Arts degree at SFASU and a Ph. D. degree at Texas Tech University. He served as the news editor and sportscaster for Nacogdoches' first radio station, news editor of the Nacogdoches Daily Sentinel, and editor and publisher of the Garrison weekly News. He edited the Texas Music Educator magazine and did extensive freelance writing. Ed Gaston joined the faculty at SFASU, where he both taught and served in a variety of administrative positions. He progressed through the academic teaching ranks from instructor to professor of English and journalism, and he held various administrative posts such as information director; director of student publications; chairman of English, journalism, and philosophy; dean of the graduate school; and vice president for academic affairs, the position from which he retired in 1986. 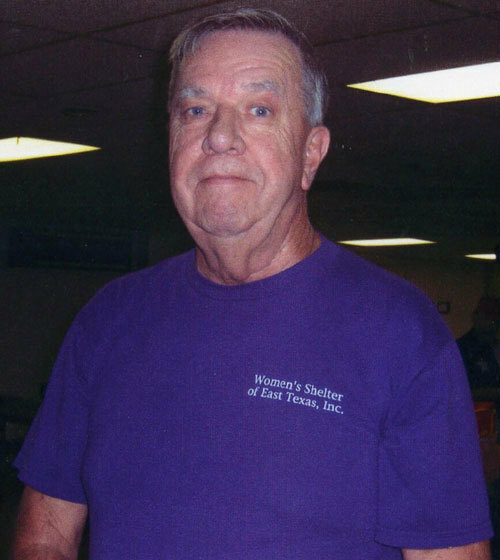 Ed Gaston passed away in October at 82 years of age. Charles Boyd was born in Kent, west of Pecos, Texas, and graduated from Pecos High School before entering the Army during World War Two. He arrived in the Philippines in time for the mopping-up operations following the recapture of those islands. Just days after the second Atomic Bomb was dropped on Nagasaki, Japan, Boyd was part of a special unit of six (6) attached to General Douglas Macarthur's staff. Assigned the unpleasant task of determining whether or not the Japanese would continue to fight prior to acceptance of surrender terms in August of 1945, their mission carried them through the atomic ash of Nagasaki. In September of 1945, Boyd's team became the first westerners to arrive in Omuta, Japan, the location of a prisoner-of-war camp. Fukuoka # 17 contained Australian, British, Dutch, and American POWs, including survivors of the infamous Bataan Death March. One of the first things they did was to raise the "Stars and Stripes" over the camp. When they saw it, many of the freed POWs cried. After the war, Boyd entered Tarleton State University to complete his education, but transferred to Texas A&M, where he received a Bachelors degree in Biology in 1951. Upon graduation, he was employed by the Texas Department of Parks and Wildlife as a game warden and field biologist. Soon he focused on research and became one of the first research biologists in East Texas. Boyd retired after forty-two years of service. Always patriotic, Boyd began flying the American flag in his front yard, careful to observe proper flag etiquette. He put the flag up each morning and gently took it down each night. His efforts inspired his neighbors to do the same, and many flag are displayed proudly along Mockingbird Lane. Sadly, Boyd passed away, but his legacy endures. His family continues to fly the American Ensign, and recently installed a permanent flag pole for that purpose. For his patriotic display of "Old Glory," we are proud to present to Charles Boyd, the Marine Corps League Certificate of Appreciation. Here to accept the award is his wife, Oweda, and his son, Alan.